Sitecraft offers Compac’s Logistec Stainless Steel Reel Handlers with designs based on extensive market research into the lifting and handling needs of current modern production environments. The Logistec Stainless Steel Reel Handlers are ideal for industries that require resistance and hygiene protection to chemicals, such as food and beverages, diary, medical and pharmaceutical. The Compac Logistec Stainless Steel Reel Handlers feature easy and safe handling of reels or coils. The reel handler is used to lift and rotate reels of film and paper by gripping the reels core and rotating them over to be placed on pallets or loaded onto a production line. The Logistec Stainless Steel Reel Handlers are fitted with a built in Torque limiter to ensure correct gripping pressure is applied to the reel’s core every time. 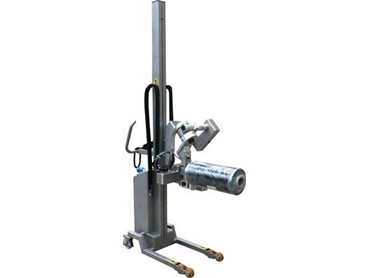 It is flexible in design, operator friendly, easy to use and offers a range of features and functions that meet current lifting requirements in industries and workshops. The Compac Logistec Stainless Steel Reel Handlers are available from Sitecraft with a fully integrated ejection collar to help eliminate potential work injuries for the operator.